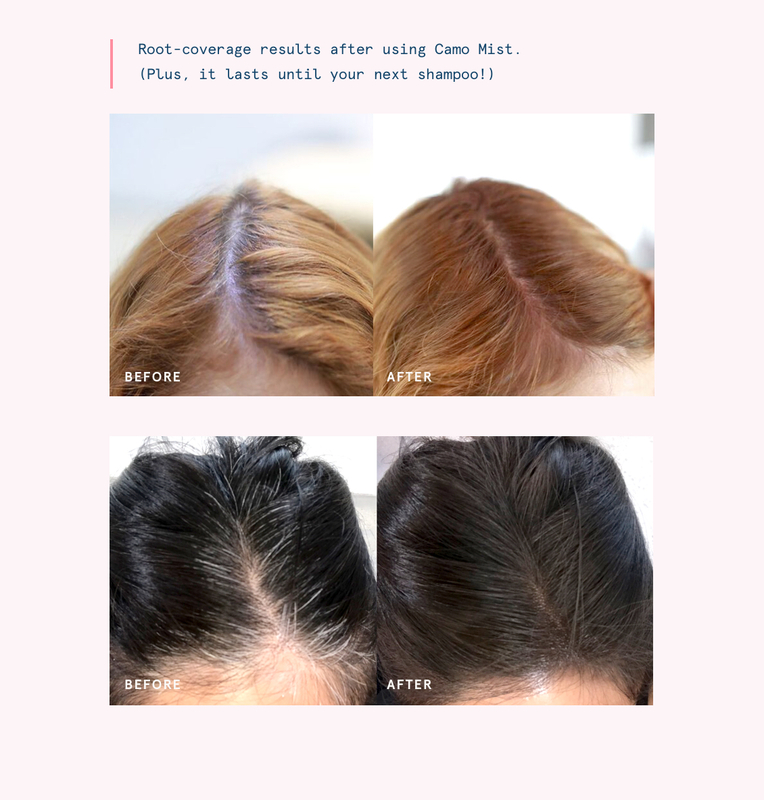 Check out these five ways to conceal regrowth and pesky grays in between hair color applications. We’ll also reveal a fresh take on root coverage with our Camo Mist—the perfect on-the-go necessity to toss in your travel bag. 01 Spray away your grays and regrowth. When pressed for time and on-the-go, a quick spraying of exposed roots makes the day that much easier with Camo Mist. Kind of like when life gives you grays, go at ‘em with highly concentrated pigment. That is how the saying goes, right? This fast-drying matte spray comes in five shades and a travel-sized can (great for TSA) with a targeted nozzle. It’s super easy, just spray 2-4 inches from your roots for the most opaque coverage, or spray further away (4-6 inches) for a sheer finish. With a targeted nozzle, you’ll spray with precision—exactly where you want the color to be. This targeted nozzle is not only precise, it’s also great for covering large, dense areas of graying roots and regrowth in seconds with a quick-drying formula that just won’t quit. With Camo Mist, you’ll get maximum coverage that blends seamlessly to your color in just a few sprays. Et voilà! Total camouflage. After applying Camo Mist, spray your favorite hairspray right over it for staying power. Or add some texture to your roots by spraying a dry shampoo before Camo Mist. Dry shampoo acts as a primer to help the pigments adhere while adding volume. Volume and optimal coverage? We think it’s a win. 02 Your eyeshadow or bronzer can double as root coverage. Need coverage in a pinch? A matte eyeshadow or bronzer can work wonders on your part or hairline. Who knew? For the smoothest application at the part line, use a flat, firm eyeshadow brush and pat the shadow into the areas you would like to conceal. Patting or pressing (lighty) the shadow in allows for fuller coverage than simply wiping it on. Feel free to mix, mix, mix shadow shades to create a color that’s similar to your current hair color. To lock-in the recently applied shadow until your next shampoo, spritz with a little hairspray. Eyeshadow can also add some bulk to baby hairs in a sleek updo, for all you fine-haired folks. For softer coverage of a larger area, we recommend using a bigger brush like a foundation brush. 03 Brush on root coverage. Not into sprays? We’ve got a Temporary Root Touch-Up. that’s as compact as your mascara with a magical wand that conceals your graying roots in a swipe. The consistency is nice-n-thick, targeting stubborn grays and regrowth in between touch-ups with precision. And it’s great for your baby hairs and any stubborn strands around your hairline. Take it anywhere, in your smallest makeup bag, and don’t worry about your roots with ten shades to choose from. 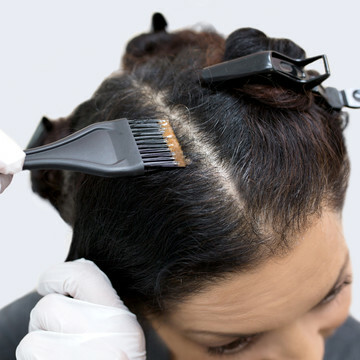 Swipe the wand beginning at the root or baby hairs, working the product away from your hairline until you’ve covered your regrowth completely. This technique helps to smooth the product down, so it looks as natural as possible. Once the Temporary Root Touch-Up is dry, take a paddle brush and softly brush your hair; brushing creates a diffused line that blends the product into the hair without a trace. 04 Change up your hairstyle. Try a new hairstyle or flip your part to another side that contains less gray is an easy way to cover your roots completely without any product (for a quick save). Hairstyles like funky top knots or braids reminiscent of Game of Thrones will do the trick by shielding your most noticeable regrowth. 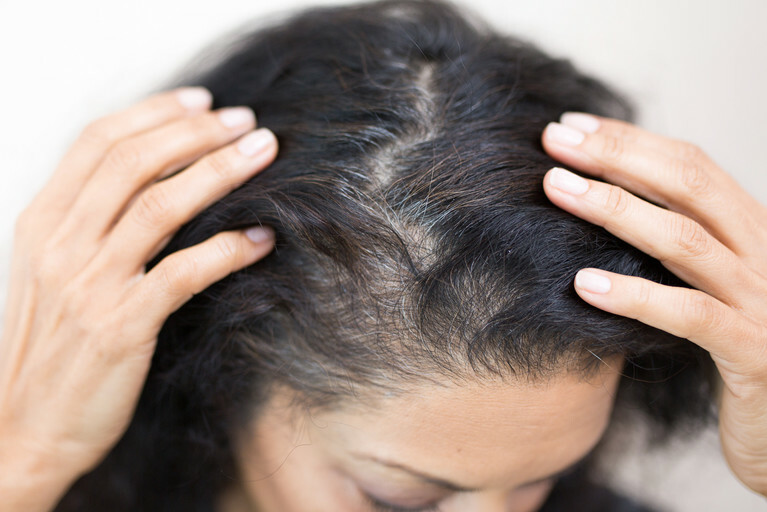 Many times, moving around how you wear your hair normally can camouflage your roots since gray hair doesn’t grow on the full head equally. As a last resort, throw on a headband to effectively cover hairline grays. As a wonderful perk, flipping your part can also increase volume and give your look an instant pick me up. Plus, you’ll have found a new way you might like to wear your hair. Don’t forget to tag @eSalon in your hair selfie when you do! 05 Add balayage highlights to mask regrowth. Balayage, or painting in freehand, is another technique used to minimize obvious roots when highlighting. Using balayage on selected strands of hair with a darker shade makes hair look more natural like you were born with it. This painting technique makes hair appear lighter which minimizes the contrast to grays, requiring a lot less maintenance than traditional highlights. For a pretty pop of color, concentrate the lightness by framing your face and applying balayage to the very ends of the hair; this adds a subtle lifting look to your color. People will think you simply got a haircut, not highlights. Want balayage? Try our Light Set. 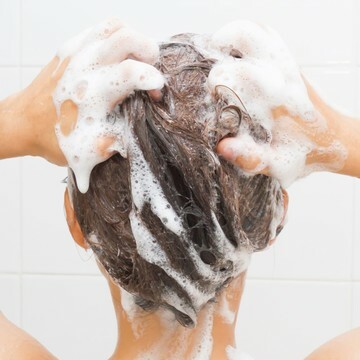 These five tips can help you tame regrowth and grays as you wait for your shipment of color, or head off to your next getaway. Because color always comes first here at eSalon, we’ve taken our most popular color families and developed quick-fix products to offer a helping hand. We’ve got you covered in between applications, and with custom hair color anytime you need it—backed by our Color Happiness Guarantee.